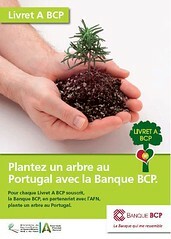 I think this is a cute “green” marketing flyer. You open an account and put money there, which is put “to work” somewhere you don’t know about (possibly a deforestation business), and you feel good about it because you sponsored the plantation of a tree. So, why not simply having a savings account actually backed by timberland? Timberland is a great investment IMO: 4% natural interest rate, and if you don’t need the cash a given year, you just don’t cut the trees (did I mention inflation protected? and actually useful if you can cash it out in firewood?). The other advantage would be that you’d actually know where your money is put to work (instead of a mere single tree). Why companies should start more independent brands. A non-profit organization providing education and tools to promote ecologically sustainable, community-based economics.